CONTACT the studio to schedule your event or activity. Taking Entries Feb. 22 3-7:30pm and Feb. 23rd 12-4:30pm Hanging Show Feb. 24th 10am -done. Show Closes March 17th. Artists must pick up work by April 19th. March 3rd Swing Into Spring Craft Show 10am-3pm and Chicken BBQ Noon-2pm ($10 presale only) at Belfast Central School King St. Belfast, NY VENDOR REGISTRATION DEADLINE: Feb. 21st. Vendors Contact: Ashley Yackeren at amorton21@hotmail.com to register. NOW OPEN Arts and Cultural Awards Nominations Nominations are now open for the Cattaraugus County Arts Council’s 4th Annual Celebration of the Arts - Arts & Cultural Awards. Nominations can be made to honor artists, arts organizations or arts supporters from Allegany, Cattaraugus, Chautauqua counties. Winners will be chosen by a review panel. Please submit your nominations by Sunday, March 11, 2018 by 11:59 pm. Belfast, NY. FREE, BYO supplies, Walk-ins Welcome. Taking Entries March 22nd 3-7:30pm and March 23rd 12-4:30pm. Hanging Show March 24th 10am - Done. Show closes April 14th. Artists must pick up work by April 16th. March 31st 1-3pm SWAN Kids Egg Painting Project at the studio. Each participant paints a papier mache "SWAN Egg" to take home. Limited seats available. RSVP by March 10th. GO TO SWAN Kids ACTIVITY PAGE for more details. April 2nd- 6th Allegany Arts Association Spring Fling Youth Arts Program at participating Allegany Arts Association Locations GO TO SWAN Kids ACTIVITY PAGE for more details. April 4th Noon-3pm at the studio. Paper Recycling Project. Up-cycle junk mail and used paper in this basic introduction to recycling your own paper and make a craft project from recycled paper to take home. (For ages 7 and up) Limited seats available. RSVP BY March 14th. 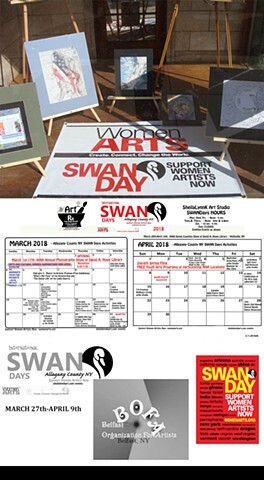 GO TO SWAN KIDS ACTIVITY PAGE for more information. April 7th 10:30am- Noon Self Care and Self Hypnosis workshop hosted by Anna Bush C.Ht., M.Ed. of Positive Moves Consulting. Donation to cover materials is appreciated. April 9th-18th Annual Teen Photo Show Ages 12-18 GO TO SWAN KIDS ACTIVITY PAGE for more information. April 14th 6-10pm Celebration of the Arts Gala at the Bartlett Country Club Annual Arts & Cultural Awards and the 20th anniversary year celebration with a 1920s themed cocktail party and you are invited to dress in your best Gatsby, flapper, or Bonnie & Clyde style.Funds raised at this event help CCAC provide a whole year of amazing arts programming, advocate for arts and culture in the region, and support local artists with professional development, exhibition and sales opportunities. Tickets are just $50 per person and can be purchased HERE, or by calling the office, 716-372-7455. April 28th 1pm Beats 2nd Annual Special Needs Dance Showcase This show is FREE for all participants and the audience. If you're a dancer and would like to perform please apply here or contact beatsdanceinc@gmail.com for an application! The show will be held at the Wellsville High School in Wellsville, NY. FB Event Page Beats Dance Showcase allows special needs dance classes from around NY to come together and share their love of dance in an annual dance showcase.